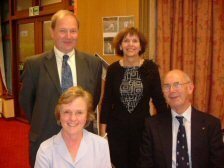 Photographs of several of the directors. 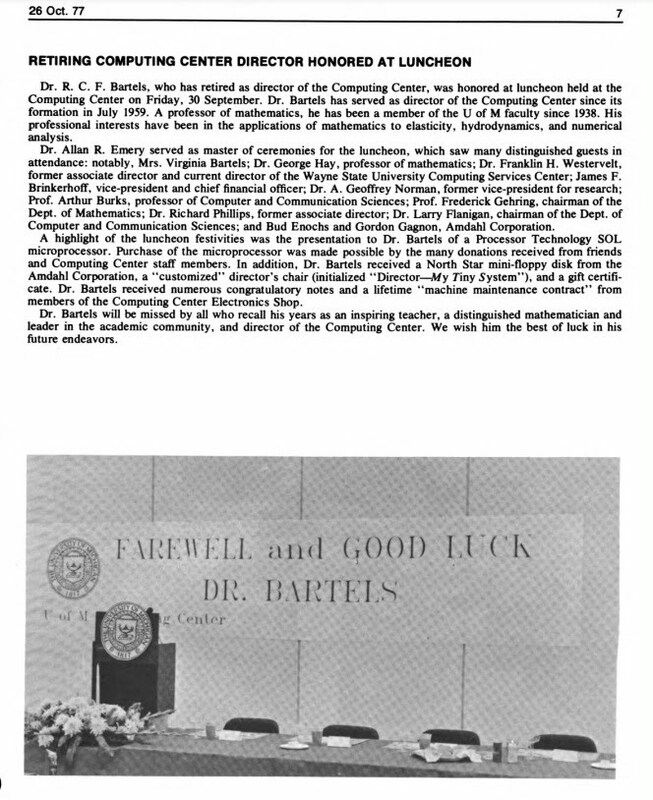 Photographs and a video from the September 2004 reception honoring Robert C. F. Bartels, the first director of the UM Computing Center. Hi, Jeff. These are my comments and corrections for your WSU paragraph. My sources are Robert Monroe's booklet and my memory. 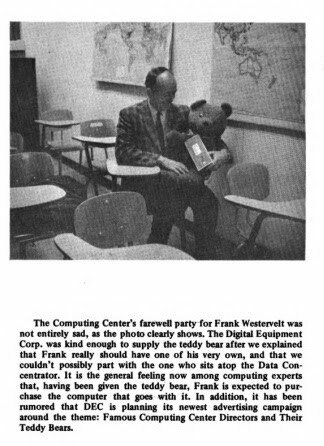 I recall that the name was indeed "Wayne State University Computing Center" from about 1957 to 1962. However, Bob's booklet does not list that name. Perhaps it was the informal name only. 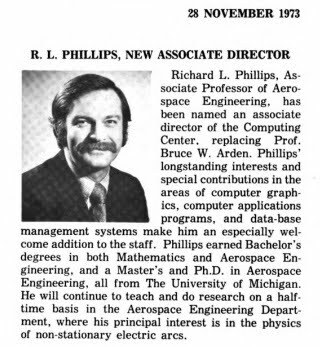 I suggest that you title the paragraph "Wayne State University Computing and Data Processing Center", which was the name from 1962 to 1977. 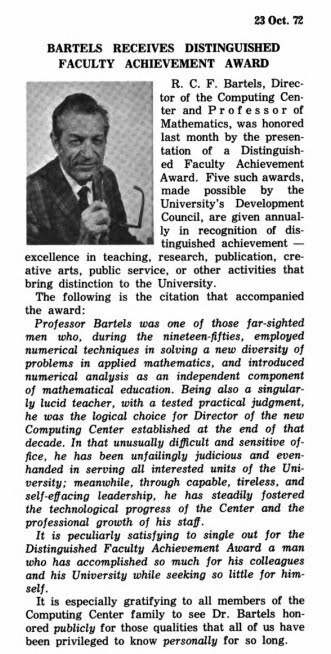 That interval included the beginning of MTS use in fall 1970. Below I list the line items that should be changed or added. Other line items are correct as they stand. 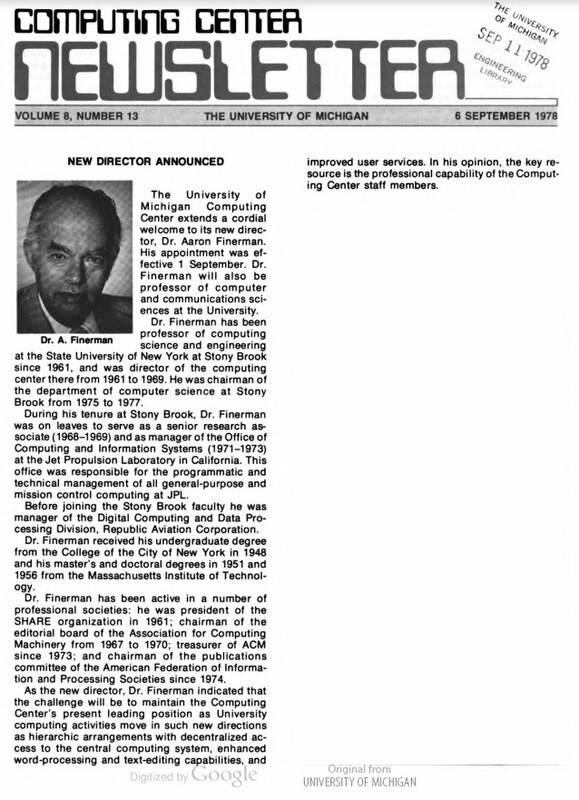 Walter Hoffman, Assistant Director, 1954?-1957, Acting Director, 1957-1959, Director, 1959-1962. The information about directors at NUMAC needs to be more subtle, because NUMAC was a bridging entity across three institutions that were themselves independent: University of Newcastle upon Tyne (NCL), University of Durham (DUR) and Newcastle Polytechnic (NPY). I don't guarantee that the details below are absolutely correct: Tony Young should be able to give much better accuracy about the Durham end of things (and probably also be able to provide details about NCL and NUMAC). Each institution had its own organisation. Newcastle had its Computing Laboratory (joint service and academic Comp.Sci.). 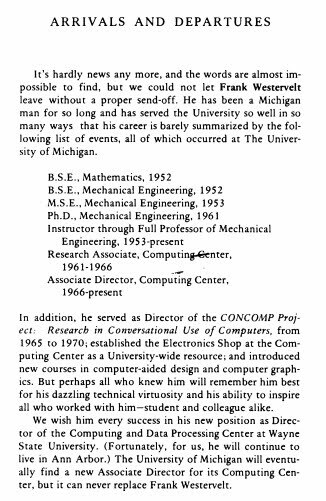 Durham had separate groups (Computer Unit for service; Computing Department academic) but under the joint leadership of John Hawgood. 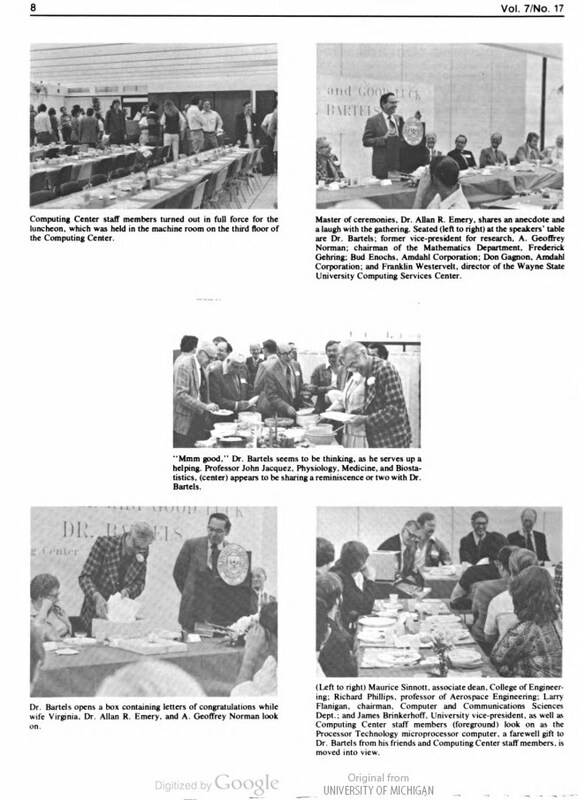 Soon after that, probably 1980, the two groups at Durham split into two departments. 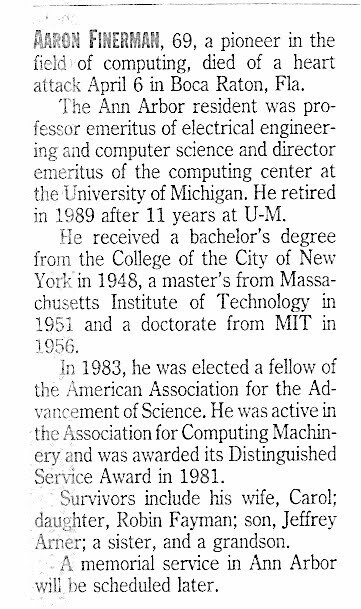 John Hawgood went to the academic side, and the late John Lindley was appointed to head the service-oriented Computer Unit. Those dates feel about right. 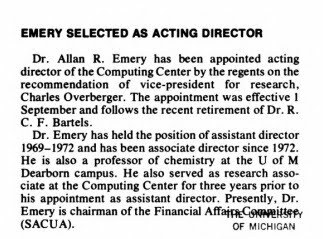 Tony Young was Deputy Director during (I think) all of that period. Along the way, the Computer Unit changed name several times. Sorry, I don't have dates for those. 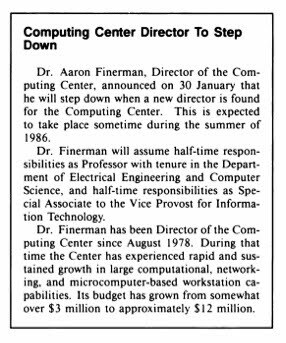 -- Durham Computer Unit (and its variously named successors) 1979-2009.